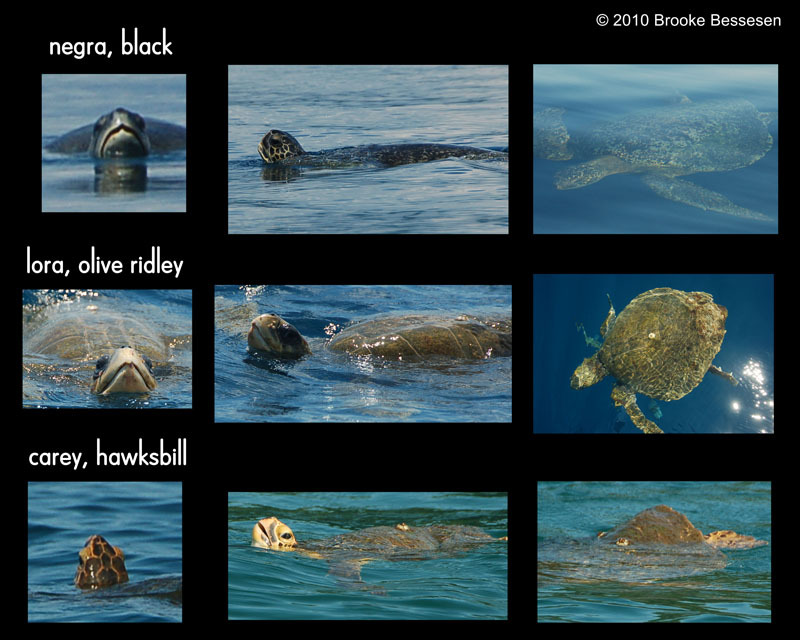 Between 2010 and 2011, we saw only ten Hawksbill sea turtles. They were found in various locations around the gulf, although all close to the shoreline. The small population of Hawksbills in Golfo Dulce is particularly important because this species is critically endangered. In fact, until recently Hawksbills were considered functionally extinct in the eastern Pacific! Called carey in Spanish, this species is often locally described as “the little turtle”, something that was confusing to me at first, since the Olive Ridley is published as the smallest species inhabiting Costa Rican waters. But of course the locals were right. The Hawksbills seen during our surveys were unquestionably the tiniest. Since sea turtles nest along the shores of Golfo Dulce, people who find their tracks are often curious which species left them. While Olive Ridleys and Hawksbills crawl one front flipper over the other, leaving an asymmetrical track in the sand, Greens pull with both flippers—like dual canoe oars—creating a more balanced print. The size of the tracks can also help determine the species. Anyone with interest in learning more about sea turtles or working with them on the Osa Peninsula should check out the Osa Conservation’s Sea Turtle Conservation Program. 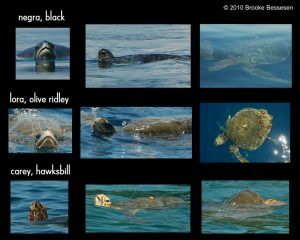 This entry was posted in Marine Conservation, Science and Research and tagged Bessesen, Brooke, Brooke Bessesen, Dulce, Golfo, Marine, osa, Osa Biodiversity, Peninsula, research, Sea, Sea Turtles, Turtles. Bookmark the permalink.